OVERKILL – Thrash Metal Warriors Announce 2017 North American Tour With NILE! Legendary New Jersey thrashers, OVERKILL, have announced their 2017 North American trek with Egyptian themed Technical Death Metal champions and label mates NILE. The 25-date tour will kick-off on February 14th at The Trocadero in Philadelphia, make stops in Chicago, Anaheim, and Washington, DC before ending at the Starland Ballroom in Sayreville, NJ. 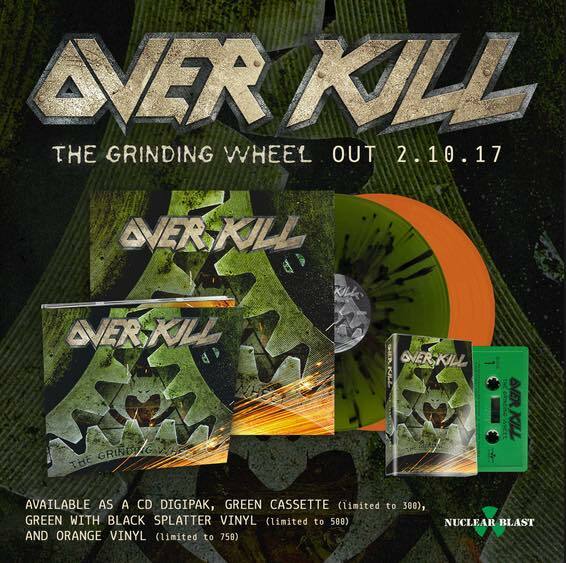 OVERKILL will be touring in support of their upcoming album, The Grinding Wheel, which will be released February 10th via Nuclear Blast. Recently, the band released the video for Our Finest Hour. NILE is touring in support of their latest release What Should Not Be Unearthed. Tickets for the confirmed shows are now available for purchase at bit.ly/overkilltour and all other ticket outlets. This entry was posted on December 24, 2016 at 2:00 pm and is filed under Heavy Metal, metal music, Music, music news, news, rock music, world news with tags Heavy Metal, metal albums 2017, metal odyssey, nile, overkill, Thrash Metal. You can follow any responses to this entry through the RSS 2.0 feed. You can leave a response, or trackback from your own site.